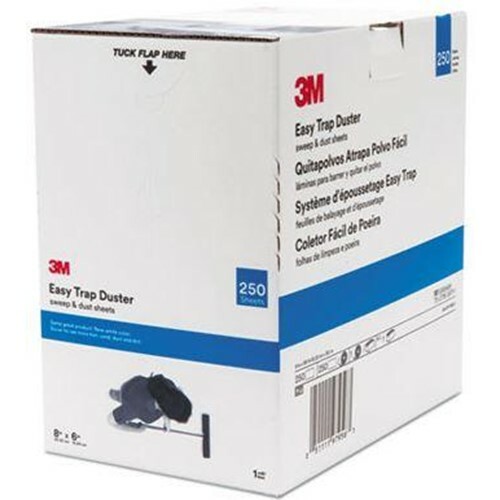 3M, Easy Trap Duster, 8 in x 125 ft, White, Sold as 1case. Home → Tools → 3M, Easy Trap Duster, 8 in x 125 ft, White, MMM55654W, Sold as 1case. 3M Easy Trap Duster - sweep & dust sheets reduce the risk of bad impressions by trapping up to 8X more dirt, dust and sand than when using traditional dust mops or a competitive sweeping dust cloth brand. Convenient disposable sheets mean no laundering. Clean the biffy in a jiffy as it glides through and traps debris, especially hair. Use under any flat floor tool or high duster. Take as little or as much as needed - comes in rolls perforated every 6". Use both sides. Expect minimum training and maximum results in vetrinarian clinics, hair salons, hospitals, gymns, schools - nearly anywhere. Details Patented technology traps up to 8X more dirt, dust and sand that conventional flat fringed cotton dust mops or a competitive sweeping dust cloth brand. Has the power to trap more hair than traditional dust mops and a competitive sweeping dust cloth brand. No special tool required. Use on existing floor tool or high duster. Glides through and traps hair even on wet surfaces. Convenient disposable sheets, no laundering required. Ideal for picking up glitter and other small particles. After one side is used, flip it over and use the other side. Sheets are made with a minimum of 60% recycled content. Packaging is made from a minimum 65% total recycled content. A minimum 35% of the total recycled content comes from post-consumer waste.